Download Now- The Stocks Stealth Bull Market 2013 and Beyond Ebook (PDF 2.7meg), the only requirement is a valid email address. Your intense efforts and serious projections are most impressive. Many thanks indeed for your scholarly guidance. be rendered, especially with ongoing debasement of currencies and likely impact on inflation - cost of living - value of investments in housing and gold silver etc it woud be highly appreciated. 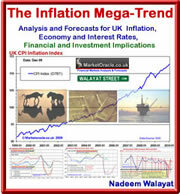 I will next be turning my attention to the inflation mega-trend proper. I dont pretend to fully understand the situation but I am starting to get my head around it with the help of your imformative material. Hi Nadeem, thanks for the analysis you give freely. You mention reducing exposure to longs by hedging. I'm new to hedging - would you give an example of a good way to hedge say a UK FTSE 100 stock that is currently paying a great dividend? There are many multiple ways to hedge stocks such as put options, shorting the futures of the stock i.e such as spread trading, shorting the weakest stock in the sector, inverse etf funds for shorting sectors etc. My prefereance is to detrmine the weakest stock in the sector and then short that.